House Panel Approves Bill That Would Grant Foreign Homeschool Families Asylum in U.S.
WASHINGTON — A House panel has approved a bill that—among other asylum and immigration concerns—would grant foreign homeschooling families asylum in the U.S. if they face persecution in their native country for opting to teach their children at home. HR 1153, approved 17-13 in the House Judiciary Committee on Wednesday, was inspired in part by the story of Ewe and Hannelore Romeike, who were under threat of deportation by American officials after they fled their homeland of Germany where homeschooling is illegal. As previously reported, the Romeikes had been battling the matter in the courts for several years while continuing to raise their six children in rural Tennessee. 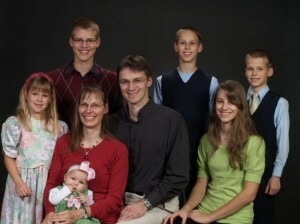 The Romeike family fled to the United States in 2008 after German authorities demanded that they stop homeschooling in violation of national law. Homeschooling was made illegal in the country in 1938 under the dictatorship of Adolph Hitler, and the law has never been repealed, but rather strengthened. The Romeike children were taken from their parents for a time because they were being homeschooled, and the family consequently fled to the United States for refuge. As the Sixth Circuit recently denied a request for rehearing, the Homeschool Legal Defense Association (HSLDA), which represented the family in court, appealed the matter to the U.S. Supreme Court. Although the court declined to hear the case, the Department of Homeland Security contacted the organization the day after the decision to advise that it had decided to grant the Romeike’s “indefinite deferred action status,” meaning that the family would not be deported as originally ordered. Now, HSLDA along with Reps. Jason Chaffetz (R-UT), Daniel Webster (R-Fla.) and House Judiciary Committee Chairman Robert Goodlatte (R-Va.), have introduced legislation that would allow up to 500 homeschooling families to be granted asylum each year. It would also require the U.S. attorney general to hire at least 50 more immigration judges, which in turn would make it easier for families to obtain asylum. “Homeschooling is no threat to free societies, and I applaud the Congress for taking action so that families like the Romeikes and others who experience ill treatment may find refuge and legal status in the land of the free,” he added. Wednesday’s 17-13 vote will now allow the measure to move on to the full House for a vote. The Asylum Reform and Border Protection Act of 2015 also addresses other matters that are more controversial, such as the influx of children coming across the border unaccompanied by their parents.